Greetings Loyal Airmen, one of the things the Air Chief loves is summer popcorn movies. Recently we’ve seen two back to back. The first was Jurassic World and then a few days ago we finally caught Incredibles 2. The latter is hilarious and kudos to Misters John Lassiter and Brad Bird. As usual we did up a little review on our FB page telling folks how much we loved the movie. Hard to believe it has been 14 years since the first one. At one time the Air Chief even had a red Incredibles telephone on his desk. Long since packed away during the move to Colorado eight years ago. 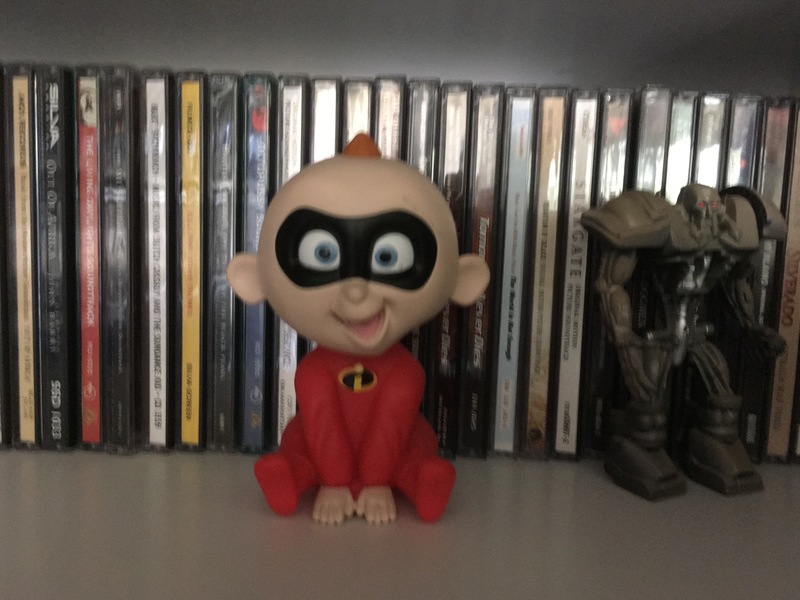 But as we sat starting this Flight Log, we looked up at our shelf of music disc and there was Jack-Jack looking back at us. And we’d totally forgotten we had him there. Took a pix to share with all of you. Again, the movie is marvelous and we urge all to go see it if you haven’t already. Next on the Air Chief’s list is Ant-Man & The Wasp, Mission Impossible : Fallout and Skyscraper. See you at the movies. Recently the Air Chief has been having a blast working with the super talented artist Mike Belcher. Mike loves the old Golden Age comic heroes as much as we do and recently we brought back the Invisible Hood in a brand new 8 pg adventure. After wrapping that up, Mike suggest we tackle as yet another old Golden Age comic book hero. 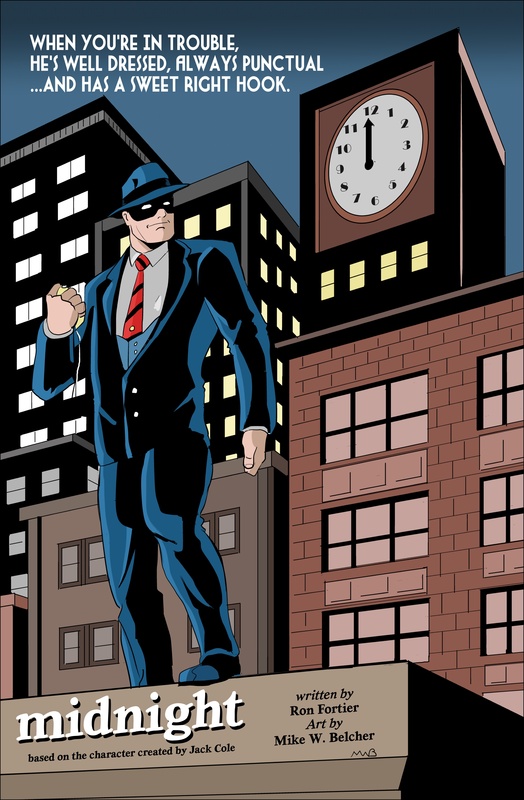 We decided one of the hundreds of such crime fighters who only wore a suit and domino mask and the Air Chief proceeded to pen an 8 pg tale entitles “A Greater Calling.” Mike loved it and did up a quick drawing of our hero. Later that night, he discovered that this particular character might still be copyrighted and suggested we change our plans. And so we put our heads together and decided to create our own Golden Age hero, NIGHTSHIFT. That’s him above, courtesy of Mike. The Air Chief redid the script to incorporate the changes and voila, a new-old hero is coming your way. Stay tuned for more as the project develops. A few years ago, Airship 27 Productions published ALL AMERICAN SPORTS STORIES Vol # 1. It was our way of paying tribute to all the great sports themed pulp magazines that were everyone on the newstands in the 1940s and 50s. We thought it would be great to bring back sports pulp fiction. Sadly, after getting out this well received first volume, we simply couldn’t get in any more submissions to keep the series going. The Air Chief was really disappointed. Well, about a week ago, acclaimed New Pulp writer Derrick Ferguson came to us asking if we’d reprint a boxing novella he’d one a few years back and was now out of circulation. 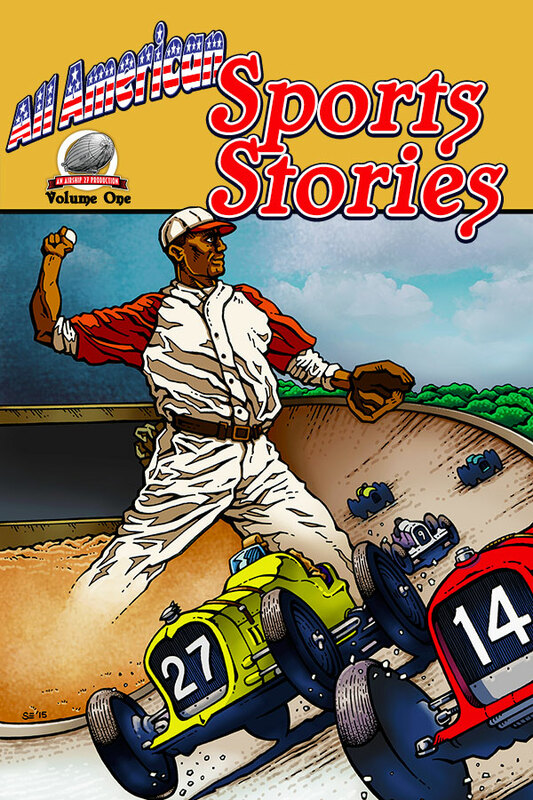 The Air Chief immediately thought of ALL AMERICAN SPORTS STORIES and told Derrick his novella is going to be a part of Volume # 2, now thanks to him, in production. We only need two 15,000 words to complete the volume and get it to you, Loyal Airmen. 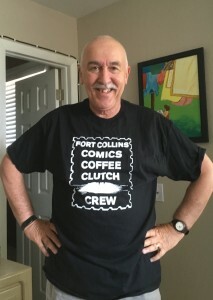 Shortly after moving here in Fort Collins, CO, the Air Chief got a bunch of comic creators together for a once a month breakfast gathering. 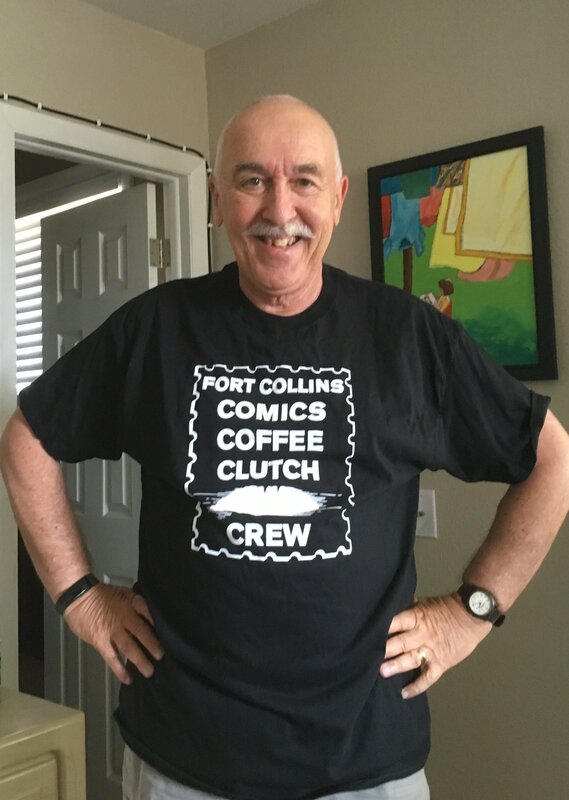 On that first meeting of what became The Fort Collins Comics Coffee Clutch Crew there were seven of us at the restaurant. Over seven years later and our number of regular members is nearing 30!! Recently one of our newest members, artist Zane Degaine designed a logo for the group, mimicking the old Come Code of Authority sticker one would see on all comics starting the 1950s up to the later 80s. The Air Chief thought it was so awesome, he suggested doing up tee-shirts and voila, 13 members ordered one. The box came in two days ago and this coming Sat, 7th July, we’ll be passing them out. Tell me these won’t make a splash at our local con appearances. And that’s it for this week’s Flight Log, Loyal Airmen, thanks for stopping by. See you all next week.